Think Big! That’s what Maruti Suzuki’s sensible hatchback for the family, the Wagon R, is doing in its third generation. As it now sits on the same platform as the Ignis, the Wagon R seems ever more promising. The larger platform, more powerful engine options and more features could make it a small car that has big hopes. Could this be the time the Wagon R steps up from being utilitarian to being sensible, sophisticated and desirable? 1.2 Litre engine’s refinement and punch improve the city and highway usability. Higher comfort levels - more space and supple suspension. As is fairly obvious, the new car still looks pretty much like a Wagon R. The sharply sculpted headlamp edges, the handsome shoulder line that steps up and then down again as it runs along the flared waist, and the tall waterfall tail lamps increase the style quotient slightly. However, it is a surprise to us that Maruti did not build on the crisp style that they used on the previous generation WagonR Stingray. Thankfully though, it doesn’t look slab-sided like it did before. On the upside, the new DNA makes the Wagon R kinder to the eyes thanks to its new proportions. It is longer by 56mm and also boasts a stronger footprint. The wheelbase is stretched by 35mm, to 2435mm, and the wheels have been pushed out further, by 140mm at the front and 150mm at the rear! This makes the Wagon R a much bigger vehicle now and the 165/70 R14 tyres look a bit skinny. This tall boy’s mini-MPV-like aura is a bit deceptive because the Wagon R’s length is still 45mm less than the Ignis! Before you ask, no. There are no LED DRLs (daytime running lights) or alloy wheels on offer. Surprising, since the Stingray had these on a VXI+ variant! The Hyundai Santro’s tall-boy quotient is firmly a thing of the past now, which leaves the Wagon R as a unique offering. With the third-gen car, the experience has only gotten richer! The high roof, the square design, the wide opening doors and the high-set seat make getting in and out of the cabin an absolute breeze. Once inside, the bigger windows make the cabin feel incredibly airy. Not that anyone would have faulted the older Wagon R on space for the passengers, but the new one is actually more spacious. By a lot! Maruti claims there is 10mm more knee room in both rows and 120mm more shoulder room too! The occupants in the front get well-shaped seats for tireless travels. However, the off-centre design for the centre console means the front passenger’s right rubs up against it frequently. One thing is for sure: the back seat will be much nicer for three adults on city jaunts. For longer journeys, two adults and a child would still be comfortable. However, the lack of adjustable headrests and the shortfall in under-thigh support tempers the “lounge” factor for the passengers here. Also, the storage options have shrunk. The clever pop-out cup holders on the dash are gone and the storage between the front seats is good for a phone or small knick-knacks. But if we talk about luggage carrying capacity, the Wagon R is insanely good. The boot is larger, depth has increased by 170mm and with the wider platform you end up getting 341 litres of storage. For context, the older WagonR had 180 litres of storage and even the Vitara Brezza offers only 328 litres! In some ways, the Wagon R feels new. The two-tone dashboard’s design looks strong and, interestingly, feels quite sturdy too. It feels better built. It also feels more lavish, thanks to a new steering wheel that has been borrowed from the Ignis. It feels nice to hold and the plushness of the steering-mounted buttons is pleasing too. The new instrument cluster doesn’t wow you but the large analogue speedo with the digital screen for the MID are easy to read. The highlight, though, is the Smart Play Studio touchscreen infotainment system that’s being offered for the first time. This system is a new design from Maruti and offers customisation options for the home screen. The Smart Play Studio App also allows you to stream music, use offline maps and control the infotainment system from your phone. It can show the fuel consumption too! However, it can’t show what is behind you as there is no reversing camera on offer. However, reverse parking sensors are offered as standard and the screen shows the warning loud and clear. Coincidentally, that is exactly what the four-speaker music system on the Z variant we were testing sounded like too. It definitely didn’t sound like a token setup. In terms of convenience, Maruti is offering a tilt adjust steering from the V variant, but height adjustment for the driver’s seat isn’t on offer at all. Also, the rear parking sensors use only two sensors, so don’t depend on just those while reversing into unfamiliar spaces. The driver also gets conveniences like one-touch down front power windows, electrically adjustable and foldable ORVMs rear defogger and rear wiper with washer. Very sensible indeed. The Wagon R’s seriousness in raising the bar is seen in the way it drives. We only had the larger 1.2-litre four-cylinder engine to sample this time. This engine has the same power and torque on offer (90PS and 113Nm) as on the Ignis and the Swift. No doubt this engine improves the ease and confidence with which the Maruti tackles all the tasks you throw at a family hatch. City commutes are chugged off with ease and highway speed overtakes won’t stress you out either. While the clutch is light and gearshifts effortless, the convenience of the AMT gearbox for big-city folks will be irresistible. Only occasionally does it falter as you try to keep pace with the cars around you -- and while it is pretty responsive even for highway use, you can always use manual mode for more control. Since the WagonR is is lighter by about 65kg, Maruti’s claimed fuel efficiency for the 1-litre variants has increased to 22.5kmpl. This is despite it being so much more spacious! The 1.2-litre’s claimed fuel efficiency is 21.5kmpl, irrespective of which gearbox you choose. The real reason why the Wagon R feels much more enjoyable to drive now is the added sense of calm and quietness. 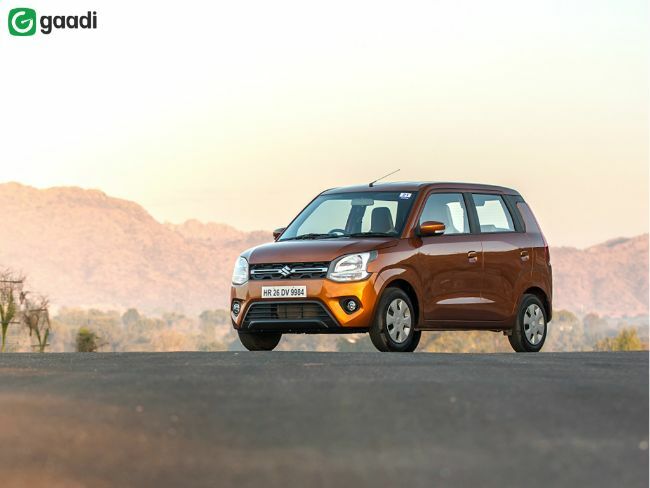 Although the 1.2-litre engine is more audible in the Wagon R than in the Ignis or Swift, the four-cylinder engine makes it a lot less tiring. Then there is the new twist beam suspension which silently shimmies over broken roads without tossing you around. The soft setup for the suspension allows a pothole to thud through every now and then, it also lets the Wagon R roll around corners. While the WagonR feels fairly confident on the highway, the body roll and vague steering will prod you to drive with restraint when the road gets winding. Also, a bit more feel from the brake pedal would be appreciated as you end up having to push a bit harder than expected to get the brakes to bite. Higher levels of safety on the new Wagon R start with the platform. The Heartect platform uses 40 per cent high-strength steel and this improves the rigidity of the chassis. Along with this Maruti is offering ABS with EBD, seatbelts with pretensioners and load limiters as standard. Dual airbags are offered as standard only on the top end Z variant. In all other variants, the passenger airbag is an option. For the very first time, the new WagonR is available with the top end ZXI variant. The base LXI and the mid-level VXI variant are also offered. The Wagon R is offered with a choice of two petrol engines and two transmission options. The base L variant is available only with the 1-litre engine and a manual gearbox. The V variant can be had with a 1-litre or 1.2-litre engine, while the top end Z variant is offered only with the 1.2-litre engine. The automatic gearbox, the AMT or AGS, is available from the V variant onwards. None of these variants get alloy wheels but the LXI variant does with smaller 13” rims compared to the 14” on the higher variants. The Wagon R is available in six colours: Silky Silver, Magna Grey, Autumn Orange, Nutmeg Brown, Poolside Blue and Superior White. The WagonR is now even more practical and sensible than before. The big-on-space quotient is enough to make it feel like it is pampering you too. The large boot and punchier engine enhances the Wagon R’s appeal as the one car for the family. While the rear seat experience could have been bettered, the Wagon R offers a significantly higher level of comfort than before, which make it much more welcoming. The Wagon R has disappointingly steered clear of the wow factor. which might hamper the excitement levels for it. But, the largely unchanged price tag makes it hard to really grumble about. So, the new Wagon R has become even more sensible and even brought in a sense of sophistication. Now if only they could add a splash of desirability too. Watch latest video reviews of Maruti Wagon R to know about its interiors, exteriors, performance, mileage and more. WagonR- India is getting SMARTER!